​Everyone likes pretty accessories. Little decorative features are common with the tools we use in our day to day activities. Pens, beer mugs, letterheads, paper bags and much more; they are all spiced up mostly by decorative print designs to add to their aesthetic properties. A lot of this detailing was done by specialists in the past, for example at a printing press but now times have changed with advanced technologies. Digitalization of many tools including printers has made them accessible and affordable to individuals who have them in their homes. You are now able to perform some of these tasks in your house. That being said, let’s take a look at how to print a design onto a paper bag. The first step is to make your design on any software that has got some graphics to it. Word, Corel draw or Photoshop. As you make your design, consider the kind of printer you have and whether the cartridge is color or black and white. A black and white design will have fewer highlights and more outlines while a colored design will have relatively more highlights. If you print a design meant for color on a black and white printer, it will have a lot of black highlights which will spoil the whole concept and create more of a mess. Scale the design to fit the area on your bag that you want to print on. You do this because that is exactly what the printer will print. If the design and bag size is not proportional, you risk ending up with a print too large that will go off the bag. It could also be too small to make any intended effect. Simple designs look better and are more logical on paper bags. A paper bag is not something with a very long lifespan. Unless it is a stored souvenir. It is going to wear out or get damaged sooner or later. It is not therefore logical to invest so much time and energy creating a complex design that will even cost more in terms of printing. A complex colored design will take up a lot of the cartridge which means you will have to replace it sooner. However, if you were just not born to design anything you can find a simple design on the internet and download the image. You can edit the image a little bit and scale it to fit your paper bag. You can also find free whole templates online which would make your work even easier. You could make your own paper bag if it is an experiment or for domestic use. Simple instructions are available on the internet on how to make one. However, you can also buy one. When doing so make sure it is not a bigger size than your printer otherwise you will have issues. The paper bag is not the conventional computer paper that you print using your personal printer. A few preparatory steps have to be taken to ensure a smooth process. So, get your paper bag and lay it flat on the computer paper. Use masking tape to hold it onto the computer paper with masking tape. Make sure you tape it lightly so that you do not damage the paper bag when removing the tape. Let the side print facing up and away from the computer paper. This taping procedure ensures that the paper bag does not get caught in the printer. The original shape of the bag is not designed for printing and there is a danger of the edges lifting up and getting caught in between the movable parts of the computer. Another way to do this without taping the paper bag to the computer paper is simply to use the very same masking tape to hold together both ends of the paper bag. The effect is the same. It is important to hold the edges of the bag one way or another; if any part of it gets stuck in the printer, it may damage some parts of it which has a cost implication. If the paper bag has got handles, it is advisable to remove them gently and return them after printing. Most handles are not flat in nature; they would normally be round. As such they are even more likely to get stuck in the printer and cause even more damage. A paper bag with flat handles though rare would be easier to work with by taping down the handles just like the edges. Do not use too much tape in the process as it increases the gauge of the parcel you will insert into your printer. You don’t want your bag rejected by the printer. Load the paper bag and print the image you have designed. For the image to appear correctly on the paper bag make sure the bottom tapes side goes in first. The reverse would have you an upside-down image. Once done carefully remove the masking tape and admire the image printed. Here is a video guide about printing on paper bags. you can follow this. An opaque bag will provide the best picture. A more translucent bag with partial light coming through will cause a distraction and cause your print not to be as visible. Preferably use water and fade resistant paints. The paper bag is something you will carry around and will be exposed to a lot of weathering. So, the print should be able to withstand some of these conditions. Change the setting of the printer to ‘heavy’ paper. The printer has got sensory properties that combine certain properties to give the best print. The paper bag is definitely of a higher gauge than normal computer paper which is what the printer is set to accommodate. Printing under this setting will most likely give you a design with one defect or another though some may not be noticeable to the eye. The better the printer the better the quality of the print. Depending on the function of the printed paper bag, you may require a varied quality of print which will be determined by the kind of printer you have. Some cheaper printers that are designed for basic office functions may not have the best qualities when it comes to printing color pieces. You can print more than one image by fitting several images within the same workspace. Again, make sure that the images fit within the same area as the actual print will appear on the paper bag. Do not print too many copies on a small capacity printer at the same time; you will burn out the printer. Print a few copies and wait for the printer to completely cool down before you print another set. However, you are covered if your printer can handle several prints at a time. You can customize and save the settings used to print the paper bag so that you simply have to retrieve the same when you want to print on a similar size paper bag. You can also save several settings for different sizes. Various simple designs can be put on paper bags using this relatively easy technique which does not require any special set of skills. You can decorate paper bags for your own use or print a small order for a small function like a wedding or birthday party. 1. Can you silk screen onto paper bag? This is a newbie question, but hey, people are asking this on forums. Honestly, silk screening wouldn’t be very effective. Consider getting some regular poster inks. Make sure to flood in between and also clean up afterward. You can also use water-based ink. You can air dry them later on. There is a poster ink called Papersolve. You only need to run them through a dryer at a low temp. 2. How to print on paper bags with handles? First of all, remove the bag handles without ripping the bag. You can reattach later, so save them for future use. Take a tape and tape down the bottom of the bag. Take another tape to close the tape. Insert the bag facing down and make sure the bottom of the bag goes into the printer first. Finally, reattach the handles. 3. How to stencil on paper bags? First of all, brainstorm your idea. It’s better to start off with a simple design. Then use any graphic designing software and illustrate the idea. Or, you can download your favorite image and print it out on a hard paper or whatever thickness your printer supports. Then take your utility tool and cut out the print. There are two ways you can use the cutout, the positive cut or the negative cut. I prefer the negative cut. Then take fabric paint and apply it to the inner part of the negative cut. Add another layer to finish the design. Finally, dry it with a hair dryer at low temp. 4. How to turn brown bags into gift bags? As long as you have stencils and paint, you can transform your ordinary grocery store lunch bags into pretty colorful gift bags. It’s a pretty quick process. Things you’ll be needing – Rembrandt’s words stencil, PanPastel sponge, lunch bags and large scalloped paper punch. Put multiple layers of the stencil on top of the paper bag, apply paint and dry off. Then apply the color you want on a blank paper and use the scalloped paper punch to make round paper shapes. That’s about it. Your creativity is the limit here. There are different ways you can use to put print onto paper bags. You don’t necessarily have to follow my way. There are hundreds of blogs and tutorials out there with each showing their own preferred way. Some methods are fast, and some are slow. Some print out good image quality, some don’t. Others have the edge on b/w printing. It depends on your needs and what you need to accomplish. 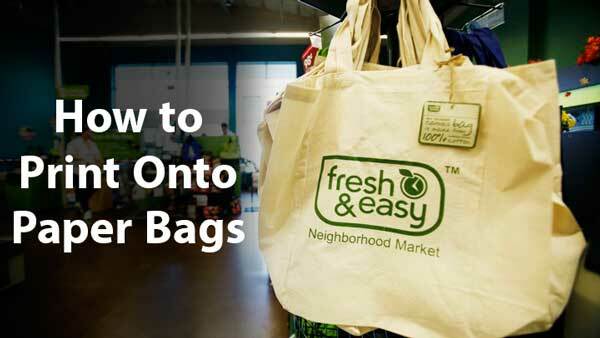 Hopefully, now you know how to print onto paper bags from this article. Be creative, let out your imagination.